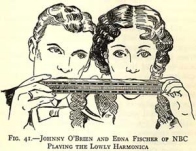 A researcher interested in the history of women who play harmonica will find very little in reference books or on the internet on this subject. In hundreds of books about blues, including several biographical dictionaries, there is no mention of any woman who played harmonica other than Big Mama Thornton and Memphis Minnie, who were famous because of their voices and Minnie's guitar more than their harmonica skills. There's very little else in blues tomes about women who play the mouth harp. There was a time when the harmonica was very popular with both men and women. Starting in the 1920s, the harmonica was taught in public schools in America and many female students participated. The giant Hohner Company of Germany, world's largest manufacturer of harmonicas, sent experts to American schools to teach children how to play. They held contests and in 1924, more than ten thousand children participated. A decade later, more than two thousand harmonica orchestras had formed. Over 150 existed in Chicago alone. 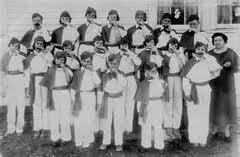 In Los Angeles, 115,127 children were enrolled in the harmonica band program between 1927 and 1937. Professional harmonica players started appearing in vaudeville acts as early as 1927 when the Harmonica Rascals combined music and slapstick comedy to become immensely popular. Other bands soon followed their example. The Rascals, created by Borrah Minevitch, were like "the Three Stooges with mouth organs" and audiences loved them. Their act featured Johnny Puleo, a midget who played the largest harmonica available, the Polyphonia, for comic effect. The Harmonica Rascals were so successful that three separate bands by that name--each with its own midget--played in different regions of the country until the end of World War II. Besides appearing on vaudeville, the Harmonica Rascals had a weekly radio program, and appeared in nine movies between 1935 and 1943. During the mid 30s Tennessee folk singer and harmonica player Rebecca Tarwater made several recordings. And Cynthia Mae Carver performed on radio and recorded under the name, "Cousin Emmy," in the 1940s. Mildred Mulcay was one of the first women to play harmonica professionally. She was a trained musician working in an all-girl band when she met Jimmy Mulcay, a Marine Band harmonica player. They hit it off right away and a few weeks later were married. The first time they played together on stage, Mildred played piano, but as she practiced and experimented with a chromatic harp, she eventually became better than her husband and took over the solos, while he switched to chords.The Mulcays were a popular act, touring around the world, entertaining troops and appearing in movies and on radio shows. Their recording of My Happiness became a million seller and a number one hit in 1953. On one American tour, their stage mate was Bob Hope. The Mulcays played popular songs and very little blues, but in the movie, Variety Girl, Mildred and Jimmy tore it up on "Tiger Rag" and "Mildred's Boogie." 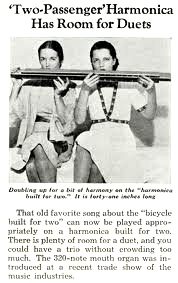 Also in 1948 came the very first song title to feature a harmonica-playing woman. Again, Mildred and Jimmy Mulcay provided the soundtrack and Patricia Koren took the vocal on a minor classic recorded by Kay Kyser and his Orchestra called, "When Veronica Played the Harmonica (On the Beach in Santa Monica)". This was also the last song title to feature a harmonica-playing gal until Paula Rangell recorded "Harmonica Girl" a few years ago. In 1950, John Brim recorded "Strange Man" featuring his wife Grace on vocals and harmonica. Grace Brim would become known as the "Queen of the Harmonica" and she made several recordings in the '50s with and without her husband. In 1952, singer/guitarist Norman "Guitar Slim" Green recorded two songs with a woman identified only as "Turner" on harmonica. That same year Big Mama Thornton recorded "Hound Dog" for Peacock Records in Texas. She did not play harmonica on the recording. The B-side was "They Call Me Big Mama." The record climbed to number one on the Billboard R&B charts, where it stayed for seven weeks and sold almost two million copies. Big Mama collected only about $500 for her big hit.